The complete Gryphens Saga is now on sale, but make sure you're getting news about future stories set within the same universe. Or if you've not yet read Prometheus Rebound, consider signing up for news updates in order to receive a free preview of the book! RSS doesn’t require you to provide any private info, like email address! If you’re new to RSS, click here for more info. More feeds available at RLAkers.com. E-mail: Provide your address here. 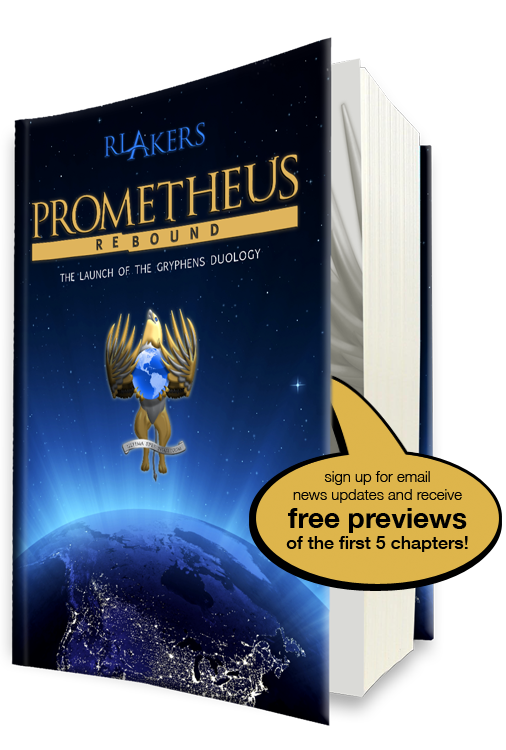 This list is managed by the author himself and will only be used to notify you of news regarding Gryphens publications, and to send you a free preview of Prometheus Rebound. You can remove yourself from the list at any time by following the instructions at the bottom of any email you receive. Facebook: Become a fan of R.L. Akers on Facebook.com, and updates will appear on your News Feed. Twitter: Begin following RL_Akers on Twitter for periodic tweets. The Gryphens Duology tells that tale. Blending military thriller and science fiction—with an emphasis on the science—new author R.L. Akers produces a well-crafted story peopled by characters you’ll grow to love and hate. When the threat from outer space becomes known, the U.S. government is caught unprepared. With time running out, the military must adapt to an entirely new variety of warfare. Pilots and soldiers must be recruited, trained, and deployed to defensive installations in orbit above North America, and technology must take a giant leap forward—with considerable assistance from a surprising source. But there are those who would halt these preparations: mercenaries and even traitors within the ranks. What motivates them to betray their world is unknown, but they will stop at nothing to prevent the newest branch of United States military from fulfilling its mandate. From the shadows of rural England to the bowels of Area 51’s Groom Lake installation, from the most remote corner of our planet to geosynchronous orbit thousands of miles above, the Gryphens Duology comprises a single well-researched and believable story about humanity’s real-world response to the threat of alien invasion. You won’t want to put these books down!